YES! Please send me a FULL YEAR of Sky & Telescope magazine for just $37.95 - a savings of 47% OFF the newsstand price! FREE INSTANT GIFTS: I'll receive the Skygazer's Almanac, Caldwell and Messier Observation Cards, and HubbleSite Lite to download and use today as a "thank-you" for paying online today. Learn more about gifts. BONUS GIFT: Plus, the SkyWatch 2018 Issue will be available for instant download with my paid subscription. Canadian orders add $12 postage & handling, orders outside U.S. and Canada add $24 postage & handling. I understand that I will receive uninterrupted service and delivery of my magazine and that my subscription will be automatically renewed each year at the rate then in effect. I won't be bothered with any renewal notices in the mail; instead, I will receive a clearly marked annual reminder about 60 days before my credit card is charged or a bill is sent. 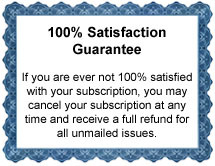 I may cancel at any time during my subscription and receive a refund on any unmailed issues by calling 800-253-0245 (U.S.), 1-386-597-4387 (Int'l), or visiting Subscriber Services. If giving a gift, this does not apply to your subscription or your gift subscription. Sky & Telescope magazine publishes 12 times a year. Savings based on an annual newsstand price of $71.88. Sky & Telescope Media, an F+W, Content + eCommerce Company, uses Secure Socket Layer (SSL) technology for all online transactions. SSL encrypts your personal information such as name, address and credit card number in an effort to prevent unauthorized access of this information during the transmission of your online order. ©2019 F+W, Inc. All rights reserved.